It was time for Karen and I to join the Japanese Bullet Club. We had been on Maglev trains in China but this time it was the real deal – The Nozomi (のぞみ, “Wish”) , the fastest train running on the Shinkansen Lines with top speeds over 300km/h. Getting all excited we made our way to the booking office. We had booked a JR Pass but that would not be activated for a few days so we splurged on the Nozomi cutting our travel time to Hiroshima down from 3 hours to 80 mins for 326km of travel. It was beginning to get dark when we got into the Station at Hiroshima as we walked the short distance to the Tram Stop just outside. 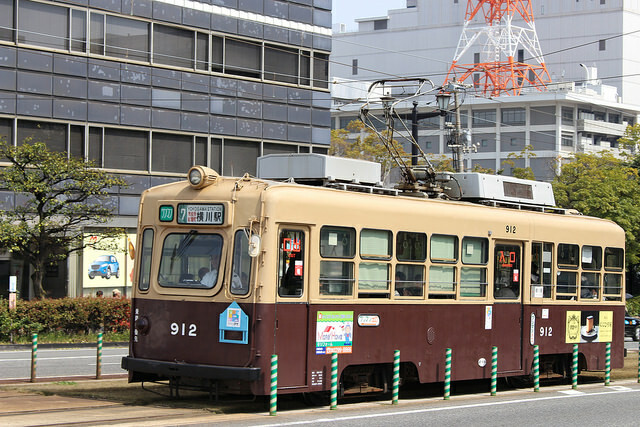 Hiroshima has an extensive Tram Network – Hiroshima Electric Railway (Hiroden). Apart from getting around there is a novelty as the fleet of 270 Trams are made up on a motley crew of Japanese and European models. There is even two antique models that survived the 1945 Atomic bombing that have been lovingly restored back into service. So no two journeys are the same. Flour-batter, sliced cabbage, bean sprouts, thinly-sliced pork, a fried egg and condiments. Layered and cooked on a hot metal surface. Flipped and served. Hiroshima’s signature pancake – Okonomiyaki. With over 2000 Okonomiyaki restaurants in the Hiroshima Prefecture it’s tough to pick the right place. We did a bit of research and found the Okonomimura – a narrow multi-story building with 25 Okonomiyaki restaurants inside. Each one the size of a single room, seats arranged around the cooking table. It would turn out to be a good choice as these restaurants use a special sauce designed by Sun Foods in their recipes. If you want a beer with your pancake you can use the vending machines on every street corner. To get there from our AirBnB we had to cross the Aioi Bridge that spans the Ota River. This bridge is unique in that it has an unusual ‘T’ Shape, connecting both riverbanks with the top of the center isle. It also has a sad history as it was used as the aiming point for the 1945 Atomic Bombing of Hiroshima (it was easily recognizable from the air). Stopping for moment we stood on the bridge to look over at the Atomic Bomb Dome – a former Industrial Union Hall. This building now stands like an eerie skeleton, standing guard over the legacy of the bomb that surrounds it. Being the closest building to the hypocenter of the blast it actually took less damage than those around it. 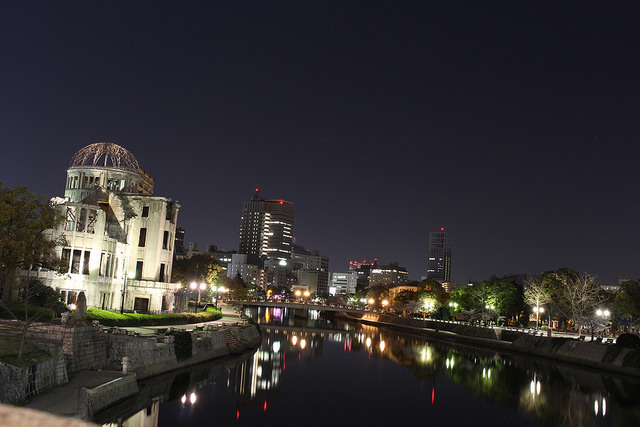 Atomic Bomb Dome at night. The Okonomimura is located inside the Hondori Shopping Arcade, reimagined in the 1950s to be a long arcade of shops, restaurants and is the main nightlife spot in the city. There is even a Taito Station – a Japanese arcade owned by the company that made Space Invaders. We also passed a few shops that had Origami birds (cranes) in the windows. It would not be until the next morning that we would learn of their significance. We finished the night with a drink at the bar at the end of the street, we were staying on called The Conte. It was an interesting little establishment that had custom jewellery for sale, 80s rock ballads blasting out of an old speaker and it served BrewDog Pale Ale (Scottish Beer). Our first stop that morning was probably the main reason we had come to Hiroshima – the Hiroshima Peace Park. It is dedicated to the legacy of Hiroshima as the first city in the world to suffer a Nuclear Attack and it’s victims (there may have been up to 140,000 of them!). It was designed by architect Kenzo Tange and stands in what was once the heart of the commercial district. We began inside the Peace Memorial Museum where we learned about Hiroshima before the bombing, the development and decision to drop a nuclear weapon on a city and the beginning of the nuclear age. It also included letters from Albert Einstein to President Roosevelt around the possibility of achieving nuclear chain reaction. One of the most interesting pieces was a video series of the proliferation of Nuclear Warheads throughout the 20th Century. We finished up with a section of artefacts from August 6th 1945. This included watches that had stopped (due to Electro Magnetic Pulse (EMP)) and the harrowing remains of a children’s tricycle. Outside this part of the museum was a large mural called the Caravan of Peace: East Sun by A-Bomb survivor Ikuo Hirayama. It was created during the Cold War and is actually one of two murals, the other in the nearby International Conference Center called Caravan of Peace: West Moon. The pair symbolise the desire of people in both blocs (Eastern and Western) to unite in peace. Stepping out of the Museum we were struck by the changes that have taken over this part of Hiroshima. The buildings all gone to be replaced by parklands covered in Cherry Blossom Trees. The brutal crime scene now has hundreds of Japanese families having picnics beneath the Sakura. And so much Sakura there was. From there we walked up along the banks of the Ota River. It was quite crowded in the peace park so we decided to see more of Hiroshima before doubling back in the afternoon. The Castle is only a replica of the one built in the 1590s as the Atomic Bomb destroyed this as well. Back when it was built the area was not called Hiroshima but instead Gokamura, meaning “five villages”. From the castle we took a tram ride out east to the suburbs of Aki a visit a more contemporary institution. Set across 55 hectares is the Mazda Automobile Manufacturing Plant. The highlight would be the U1 Car Assembly Line – one of the longest in the world. It is also the location of the Mazda Museum. All the tour slots were full but sometimes ‘full’ does not quite mean it – so we rolled the dice and rocked up. We got knocked back. Sorry Tour is full and no more room. What a waste. 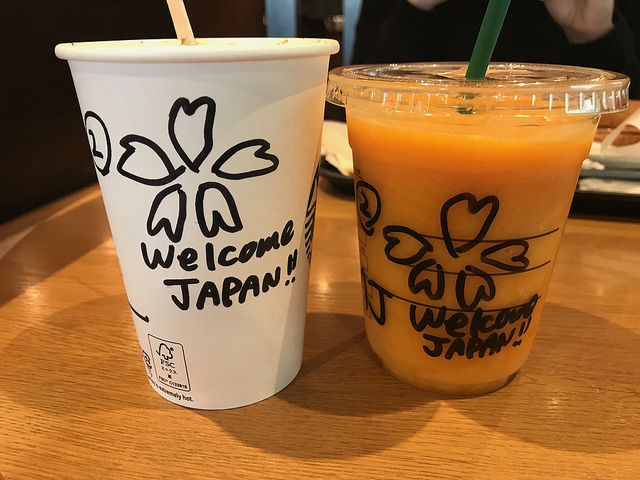 Japan Tip #3: You can normally blag your way onto a tour, especially if it is undersubscribed or you turn up with a sob story. Not in Japan. Rules = Rules and no leniency is given. Bear this in mind to avoid disappointment later. We made it back into town and grabbed some awesome Tempura for lunch at Nokiya. A cute traditional Japanese restaurant that packed a Shoryuken! After that we made our way back to the Peace Park via the Shukkei-en, a Japanese Secret Garden. Constructed in the 1620s during the Edo Period at the order of Asano Nagaakiro with the help of experts from Kyoto. It is built to simulate West Lake in Hangzhou with a large pond and 10 island parts with a number of islands linking them. We made it back to the Atomic Peace Park in the afternoon, the morning rush had dissipated so it made a more personal touch to our visit. We wandered over to the Children’s Peace Monument- a statue of a girl with outstretched arms carrying a folded crane rising above her. It is based on a rather sad story of a girl (Sadako Sasaki) who believed that she would be cured of her radiation poisoning if she folded 1000 paper origami cranes. The 1000 Paper Origami Crane test is called Senbazuru, it is from an old Japanese legend that folding 1000 paper origami cranes would grant a wish from the gods. She became too sick to finish the task so her schoolmates finished it for her. Unfortunately she did not recover. Today it is a living monument as people around the world send in their own Senbazuru in honour of Sadako and all the children who died. As we were in Japan we would have to try Sushi. Would it be the same as back home, what would the variations be. It turns out there are so many more choices, including something called Mantis Shrimp. John had to try this. We also got chatting to a business man who goes to this restaurant so frequently that he has a bottle of Sake behind the bar with a little tag with a buck-toothed drawing (it looked just like him). 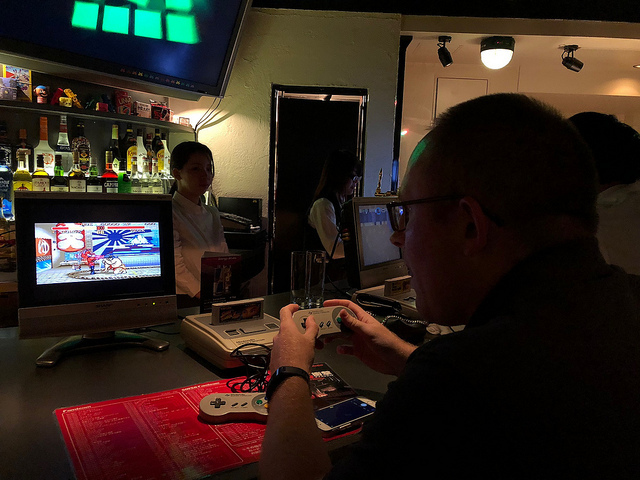 Our last night was young so we went in search of drink only to stumble upon one of Japan’s biggest crazes right now – retro gaming bars. This one in particular, 8BitBar was really awesome. The premise is quite simple. You go to the counter and order some Suntory Highballs or Kirin Beers and then look at a menu and select what gaming console and game you wanted. A bit like ordering some bar snacks with your drink only way cooler. That was our little jam-packed trip to Hiroshima. Next up was a short hop to Miyajima Island. Excellent post capturing the spirit of Hiroshima. Pity you couldn’t get onto tour of Mazda Museum. I enjoyed the bullet train so much it was better than flying. Loved Hiroshima. I didn’t catch the bullet trains in Japan but have also done many tines in China.